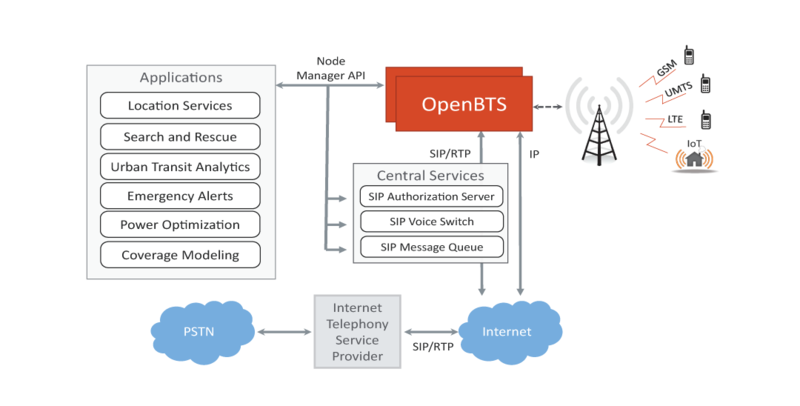 The OpenBTS software is a Linux application that uses a software-defined radio to present a standard 3GPP air interface to user devices, while simultaneously presenting those devices as SIP endpoints to the Internet. This forms the basis of a new type of wireless network which promises to expand coverage to unserved and underserved markets while unleashing a platform for innovation, including offering support for emerging network technologies, such as those targeted at the Internet of Things. It’s all software, it’s all IP, and it’s open for innovation. A handset or modem appears as a SIP device, without the need for any special software on the device. For small networks, the network hardware can be reduced to a single commodity server with a software-defined radio. Any IP connection can serve as backhaul, including point-to-point WiFi. All of the software runs on Linux and connects with commonly used IP protocols, so the core network can be virtualized as a cloud service. Proprietary software found in a conventional cellular network can be replaced with open-source applications. Because the new network is based on IETF internet-age protocols, developers do not require additional training to deal with archaic legacy technologies.